Let me pretend for a moment that I am Vladimir Putin. Ukraine has had strong ties with Russia ever since we annexed the Crimean Khanate in 1783. Barely 25 years ago it became independent. The first 10 years were a mess, with a 60% loss in GDP. In 1996 Kuchma was elected president and as corrupt as they get. Since 2004 Yanukovych and Yushchenko have been taking turns at rigging elections and mis-managing the country, which is now in a shambles. Earlier this year it is brought to my attention that the EU is negotiating closer ties with Ukraine. The logical conclusion is that Ukraine will sooner or later join NATO. When that happens, my naval base at Novorossiysk would be barely 125Km from Kerch, from whence it would be easy to deny us naval access to the Black Sea. This is strategically unacceptable, as sailing to the Mediterranean / Africa / the Middle East from the Baltic or the Pacific is unthinkable. To keep unfettered access to the Black Sea, the area from Donetsk to Sevastopol cannot be allowed to present a threat to Russia, the question is: how do I achieve this? Simply invading the area would probably succeed. The Europeans would procrastinate, Obama would chastise, but nothing would be formally done to stop me, and reasonably so: the Europeans need our natural gas and Obama has repeatedly shown that he won’t go to war just because some foreigner’s rights have been trampled. Get the KGB to identify self-seeking troublemakers in Ukraine and encourage them to sue for ‘democracy’. Provide appropriate financing to sustain them for a few months. Once the demonstrations are in full swing, send in half a dozen elite snipers to pick off the noisiest, thereby turning them into martyrs. Actively propagate the rumour that the snipers were Ukrainians, the Internet will do the rest. Pay said snipers handsomely to keep their mouths shut. The troubles created will be enough to dissuade foreign aid and investment, the economy will tank, what remains of the government will be incapable of restoring law and order. Announce that I am providing assistance to Russian nationals in Eastern Ukraine. To prove my good faith, get the KGB to suggest holding a referendum to some red-neck local, who takes the bait and goes on TV calling himself the new president of Crimea. The outcome of the referendum is a foregone conclusion: Crimea wants to be part of Russia. For the stupid foreigners’ benefit, encourage the notion that Crimea and Eastern Ukraine are the same thing. Stupid foreigners beguiled, instead of sending my troops to Eastern Ukraine, I send them to the Crimea to establish my strangle-hold on Sevastopol. Wait a few months, to let the world accept that Crimea is once again part of Russia. Based on the success of the Crimean referendum, find a clown in Donetsk to suggest a similar referendum in what really is Eastern Ukraine, roughly from Kharkiv to Melitopol. Rig said referendum if necessary, funds are no object. 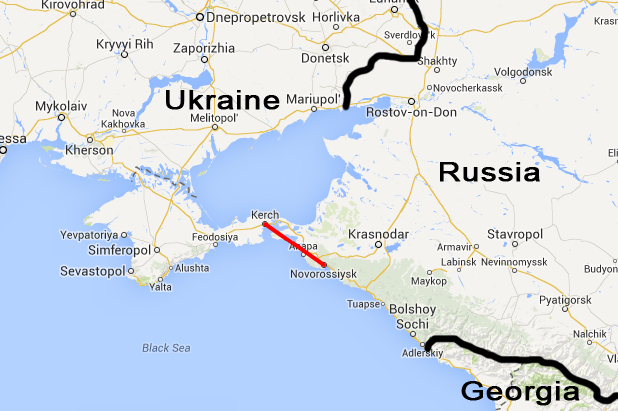 The line east of Kharkiv – Sevastopol is now part of Russia and I’ve achieved my goal.